At the gates of Dresden, this railway has been puffing from Radebeul Ost station via Moritzburg to Radebeul. The Lößnitzgrundbahn railway, nicknamed "Lößnitzdackel" (Lößnitz Dachshund), carries passengers through a fascinating landscape. After starting at Radebeul Ost station, the narrow gauge railway goes through Radebeul and reaches the railway and tram crossing at "Weises Roß" flag stop. From there, the railway weaves through the vineyards of Hoflößnitz palace into Lößnitzgrund valley, a popular local recreation area. Linked to this is a special offer of the Lößnitzgrundbahn: "wine drinking pleasure on narrow gauge trains." 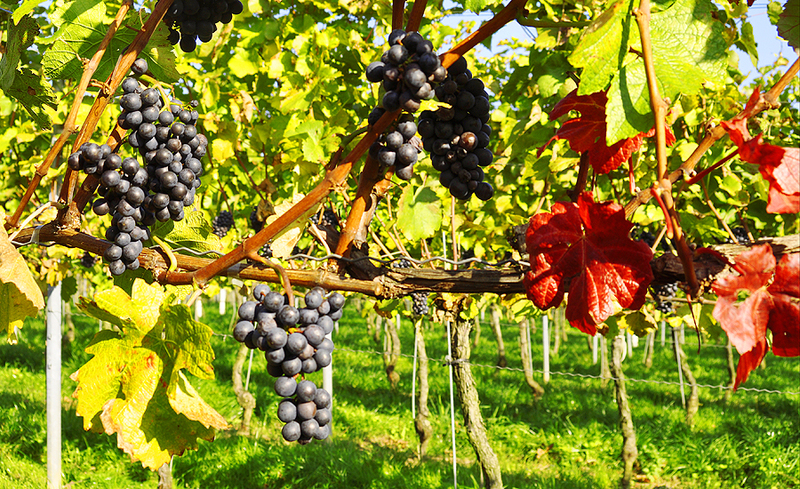 During this three-hour program, you can enjoy fine wine, real treats and, of course, the narrow gauge railway. Shortly after the new route was opened, many summer visitors discovered the area around the Lößnitzbach stream, leading to the development of passenger and goods traffic on the entire route. Passing the "Lößnitzgrund" and "Friedewald" stops where you have the option to get on or off the train, the journey will continue up to the "Dippelsdorfer Teiche" ponds, situated in the Moritzburg woodland and pond landscape. From "Friedewald Bad" station, the narrow gauge railway crosses the pond via a 210-metre-long dam before arriving in Moritzburg. Located within a short walking distance of the station, August the Strong's famous hunting lodge and pleasure palace offers unique treasures within a castle of gorgeous architecture. The “Fasanenschlösschen” pavilion (Little Pheasant Castle) and the adjacent lighthouse are further silent testimonials of the myth of August the Strong. Then continue your trip in the direction of "Endhaltepunkt Radeburg" (final stop). The woodland and pond landscape is followed by a charming agricultural area. Shortly afterwards, the Lößnitzgrundbahn arrives at the final stop in the little town of Radeburg, where Heinrich Zille was born. Also the locomotive depot of the “Traditionsbahn Radebeul e.V.” traditional railway society is located there. The Saxon IV K 176 locomotive is normally parked in Radeburg until the traditional railwaymen's next riding day. Besides providing a safe shed for the engine, the engine shed also serves as a good place for repairing the steam locomotive. The volunteer work performed by the traditional railway society mainly involves organising and carrying out special excursions on the route between Radebeul Ost and Radeburg stations. 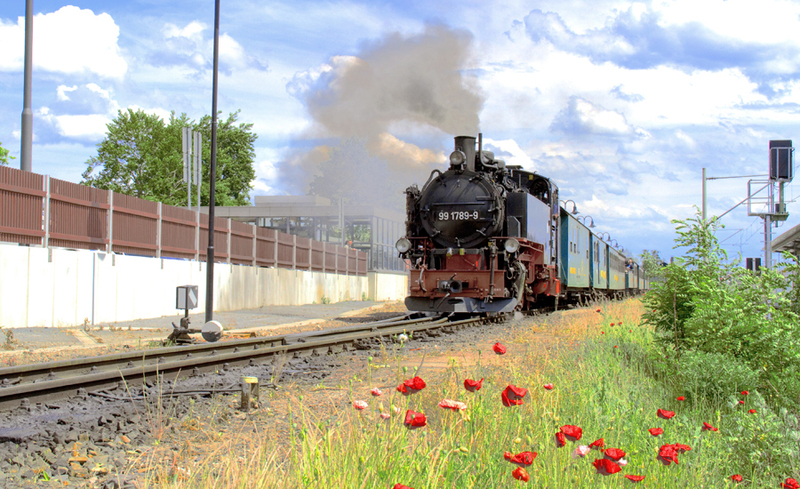 In addition to the annually recurring special excursions to the Karl May and Narrow Gauge Festivals, fixed-date theme tours such as "Dixie, Steam and Dachshund" or the "Osterhasenexpress" (Easter Bunny Train) are offered on certain weekends. 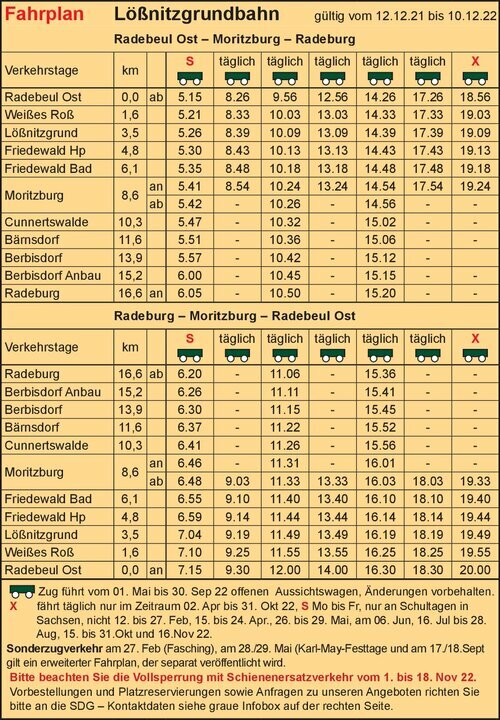 Thanks to the close cooperation between Lößnitzgrundbahn and Traditionsbahn Radebeul e.V., passengers can choose from numerous special steam railway experiences throughout the year. The Lößnitzgrundbahn has its origin in Radebeul, northwest from Dresden located. The railway line runs in constant slope through the Lößnitzgrund, then crossed the pond and then Dippelsdorfer via Moritzburg to Radeburg. 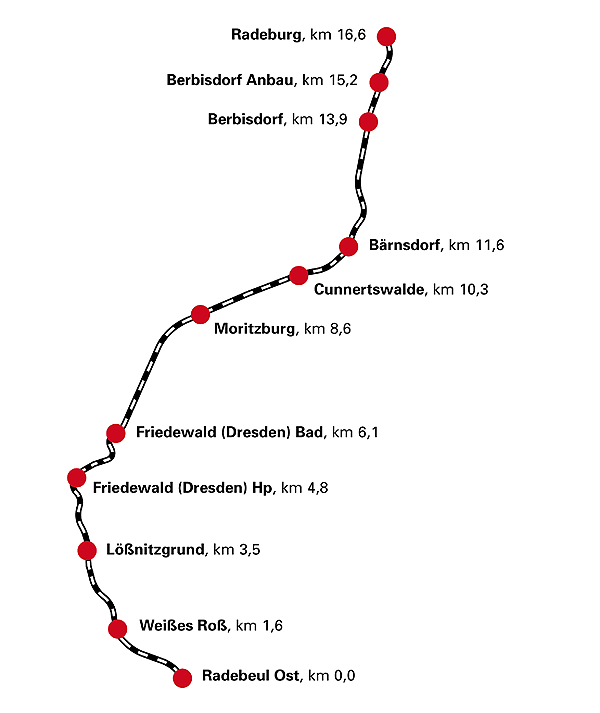 The Lößnitzgrundbahn is easily accessible with the Dresden S-Bahn, it is in Radebeul Ost cheap access. Furthermore, you can also access the Dresden tram line 4 directly to the train station White horse if you get off at the stop regional theaters. Information on the timetables of trains, trams and buses is available online at the Upper Elbe Transport Association (VVO). By car the Lößnitzgrundbahn is well connected to the A4 (Radebeul) and A13 (Radeburg). The Lößnitzgrundbahn runs daily with steam trains.